Gold-looking coins with realistic detail. Kids can trade, win, search for treasure! 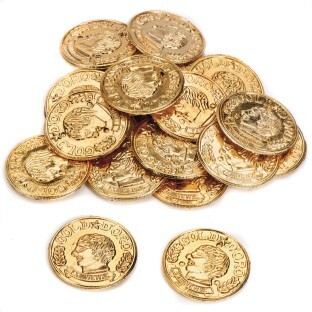 1-1/2" plastic ancient gold-look coins with realistic detail. Used the coins for a dreidel game in place of chocolate coins. They were less messy and could be reused. These pretend coins are okay but a bit flimsy and kind of cheap looking. Okay for the price but not great. The kids just loved breaking open the pinata and finding the gold coins. they liked them better then the candy. I bought these to use in conjunction with a treasure hunt for older children. Also bought the treasure chest they worked great together.